1220 Johnson (1421 Stelts x 220 Debacco) - Best plant I've ever had by far with a lot of world record genetics crossed into it. 335 Scherber (1421 Stelts x 1161 Rodonis) - Fell in love with the plant my son grew this last season. 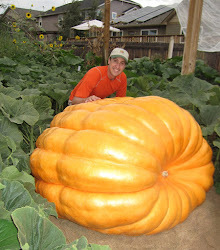 It is a cross of two clone plants that produce some big, orange and heavy pumpkins. 971 Scherber (1623 Stelts x 1655 Ford) - Colorado state record crossed into a 1623 plant that had a lot of the world record traits and was 100lbs ahead of the state record pumpkin when it went down. 282 Scherber (1725 Harp x Self) - This is a clone of the world record plant crossed with itself. 1791 Holland (1495 Stelts x 2009 Wallace) - This is a cross of what may be the best two genetic lines available and maybe one of the top three plants on each side. 1317 Clements (1495 Stelts x 2009 Wallace) - See above. I'm starting a lot more plants this year than I have in the past and will go with whatever is looking best. Wish I had a spot for all of these plants. Happy New Year! Today I started doing some tests with my new toys I got for Christmas. Pictured here is my new seedling heat mat. Normally you would use this to warm the soil in your pots but I'm trying it for my seed starting. It will take a little experimentation to get the temperature just right and make sure it doesn't fluctuate much. Every hour or so I'm using a thermometer to check the temps. When I first started out and didn't have the seeds on the mats I found that temps were around 75 degrees with the mat sitting on the shelf. I put a towel under the mat and temps went up to about 85 degrees. I then add the zip lock bags with the seeds and checked the temps but found that zip lock bags were trapping heat and the temps were getting up to about 92 degrees and I'd prefer it around 88-90 degrees so I've removed the towel and seeing what that does.